In this Free Cisco Lab scenario you will learn to configure VLAN routing using an external router with sub-interfaces and 3 Layer 2 switches. 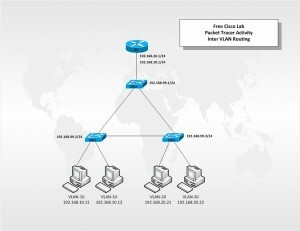 This lab has been created in Cisco Packet Tracer but can be completed with GNS3 or real hardware. You will create sub-interfaces on the Ethernet port fa0/0 and encapsulate it as 802.1q and assign a VLAN to it making a router on a stick configuration. This configuration will become very useful when you start configuring VoIP.